Gulf Construction Online - Aykonic! Aykon City ... six luxury towers. Luxury real estate developer Damac Properties has launched Aykon City, a massive six-tower luxury project on Sheikh Zayed Road overlooking the Dubai Canal in Dubai, UAE. Destined to become another icon of Dubai’s real estate landscape, the project is being developed in collaboration with Meraas Holding. Aykon City will boast Dubai’s first all-suites, 80-storey Aykon Hotel and Residences, a 63-storey Damac Maison serviced hotel residences, a 60-storey apartment tower, a 65-storey office tower and two 30-floor ultra-luxury residential towers featuring state-of-the-art car lifts to each unit and direct views over Dubai Canal and Safa Park. The 4-million-sq-ft development is located on the eastern and western sides of Sheikh Zayed Road at the Safa Park intersection and in close proximity to the Dubai Canal. It will join other iconic developments in the golden quadrant of the business district of the city such as City Walk, the Burj Khalifa, Emirates Towers and the Dubai International Financial Centre (DIFC) district. The project will also feature the Aykon Dare, an addition to Dubai’s tourist attractions, an adrenaline experience on the 80th floor of the hotel where guests get to walk around the outside of the tower’s roof. For the less adventurous, Aykon City will also consist of the Aykon Plaza with swimming pools, spa, beach club, cafés, restaurants, yoga and Tai-chi areas, and private members club. Construction is due to commence before this summer with a completion date of 2021. The project sales value is Dh7.4 billion ($2.02 billion). There will be a limited release of the serviced residences for sale soon with further releases in due course. Meanwhile, Damac Properties has purchased land in Dubai for Dh1.26 billion ($343.1 million). The plots, located on the eastern and western sides of Sheikh Zayed Road close to the Dubai Canal project, will add around 4 million sq ft to the company’s land bank, according to the company. The land was purchased through the company’s subsidiary, Damac Properties Development, it adds. The leading developer of high-end properties in the Middle East registered a net profit of Dh4.51 billion ($1.23 billion) for 2015, up 30 per cent over the previous year. Among other developments, Damac Properties says it has become the first UAE real estate developer to introduce special investment products that guarantee the capital and annual returns for its investors. The company is now offering products that will ultimately provide investors and those looking for safe and high returns with the opportunity to navigate the Dubai property market with total peace of mind. 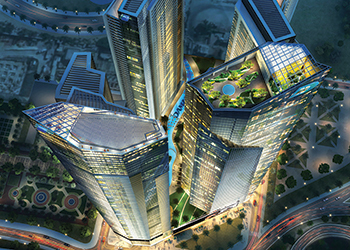 According to Damac, it has introduced two new schemes for investors. One of them guarantees annual returns on advance payments during construction of three per cent every year which is equivalent to twice the interest on fixed deposits. Customers will receive the payments twice a year until completion of the unit, states the high-end luxury real estate developer. The other scheme is the “Damac Capital Guarantee” which guarantees the property’s value for two years after delivery; the company will pay the difference to the investors if the unit price has any decline between the time of delivery and the end of 2019. Damac Properties has a wide range of stylish living options across Dubai, including private villas, townhouses and apartments within its two golf course communities, Akoya by Damac and Akoya Oxygen which allow individual investors to capitalise on the emirates booming tourism sector.